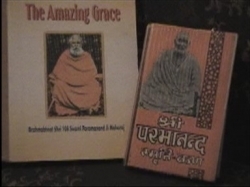 The Amazing Grace - is a complete book about Shri Maharajji. See in Hindi as श्री परमानंद स्मृति कण. Sadachar - the last discourse by Shri Maharaj ji. Same discourse Also available in hindi as सदाचार. Gayatri - simple and detailed meaning of gayatri By Shri Maharaj ji. Also available in hindi as गायत्री. Discourses - the ultimate knowledge in very simple words by Shri Maharajji. Also see in Hindi as उपदेश. Stories - some beautiful tales directed by Shri maharajji. These are also available in Hindi as कहानियाँ. © Anandkebeechmain.com. All Rights Reserved. Best viewed in Mozilla Firefox with a resolution of 1024 x 768. View Disclaimer.